Henrietta of England (16 June 1644 O.S. (26 June 1644 N.S.) – 30 June 1670) was the youngest daughter of King Charles I of England, Scotland and Ireland and his wife, Henrietta Maria of France. Fleeing England with her governess at the age of three, she moved to the court of her first cousin Louis XIV of France, where she was known as Minette. After she married Philippe of France, brother of King Louis XIV, known as Monsieur at court, she became known as Madame. Her marriage was marked by frequent tensions. Henrietta was instrumental in negotiating the Secret Treaty of Dover prior to her unexpected death in June 1670. 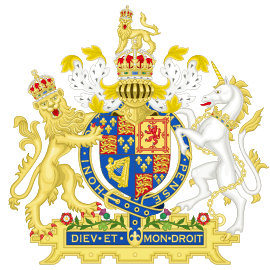 Jacobite claims to the throne of Great Britain following the death of Henry Benedict Stuart descend from her through her daughter Anne Marie, Queen of Sardinia. Princess Henrietta was born on 16 June 1644, on the eve of the Second Battle of Newbury during the Civil War, at Bedford House in Exeter, a seat of William Russell, 5th Earl of Bedford (1613-1700), who had recently returned to the Royalist side. Her father was King Charles I of England, her mother the youngest daughter of Henry IV of France and Marie de' Medici. All her life, Henrietta would enjoy a close relationship with her mother, Queen Henrietta Maria. 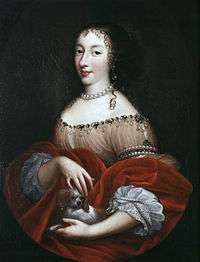 Her connections with the court of France as niece of King Louis XIII and cousin of Louis XIV would prove to be very useful later in life. Shortly before the birth of Henrietta, her mother had been forced to leave Oxford for Exeter, where she had arrived on 1 May 1644. Many thought she would not survive the birth due to her state of health at the time. After a particularly difficult birth, the princess was put in the care of Anne Villiers, Countess of Morton, known at that time as Lady Dalkeith. For the safety of the infant princess, the queen decided to make her way to Falmouth and then return to France to ask Louis XIV to assist her husband's war efforts. Arriving at Falmouth in mid-July, the queen was informed that the infant princess had been taken ill with convulsions, from which she recovered. On 26 July, Henrietta met her father, Charles I of England, for the first time. Prior to his arrival, the king had ordered that the princess would be baptised in accordance with the rites of the Church of England, and she was baptised Henrietta at Exeter Cathedral on 21 July. A canopy of state was erected in honour of her dignity as a Princess of England. 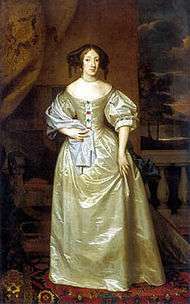 Henrietta was moved to Oatlands Palace outside London, where the princess and her household lived for some three months before fleeing secretly in June 1646, Lady Dalkeith ensured Henrietta's safe arrival in France where she was re-united with her mother. While living at the French court, the princess was given the name Anne in honour of her aunt, the French queen Anne of Austria. When she first arrived, she was known as Henrietta d'Angleterre or the princesse d'Angleterre in France. She and her mother were given apartments at the Louvre, a monthly pension of 30,000 livres and the use of the Château de Saint-Germain-en-Laye. This lavish establishment soon diminished as all the money Queen Henrietta Maria received was given to her husband in England or to exiled cavaliers who had fled to France. During the Fronde, the civil war that raged in France between 1648 and 1653, Henrietta and her mother stayed at the Louvre. In February 1649, Henrietta's mother was informed of the execution of her husband Charles I, who had been beheaded on 30 January. At the end of the Fronde, Queen Henrietta Maria and her daughter moved into the Palais Royal with the young Louis XIV and his mother and brother Philippe. At the same time, Queen Henrietta Maria decided to have her daughter, who had been baptised in the Church of England, brought up as a Roman Catholic. With the arrival of Henrietta's brother, Henry Stuart, Duke of Gloucester, in 1652, their small court was increased. After the Fronde was over, the French court made it a priority to find a bride for the young king of France. Queen Henrietta Maria hinted at the idea of a union between Henrietta and Louis, but Queen Anne rejected the idea, preferring instead her niece by blood, Maria Theresa of Spain. Louis and Maria Theresa married in June 1660, after which Queen Anne turned her attentions to her unmarried son Philippe. While residing at the Château de Colombes, Henrietta Maria's personal residence outside Paris, mother and daughter heard of the restoration of the monarchy in England under Henrietta's brother Charles II of England, and they returned to Paris. This change of fortunes caused the flamboyant Philippe, a reputed bisexual who had been party to a series of sexual scandals, to ask Henrietta to marry him. Prior to this, rumours at court stated that Henrietta had received various proposals from Charles Emmanuel of Savoy and the Grand Prince of Tuscany but nothing came of them as a result of her status as an exile. An impatient Philippe was eager to make sure he married Henrietta as soon as possible, but Queen Henrietta Maria was intent on going to England to sort out her debts, secure a dowry for Henrietta and prevent the Duke of York's announcement of his marriage to Anne Hyde, a former maid-of-honour to the Princess Royal. During this time, Henrietta became distraught when her brother the Duke of Gloucester died of smallpox in September 1660. In October, Henrietta and her mother embarked at Calais for Dover, where they stayed at Dover Castle. The French court officially asked for Henrietta's hand on 22 November and her dowry was arranged. Charles II agreed to give his sister a dowry of 840,000 livres and a further 20,000 towards other expenses. She was also given, as a personal gift, 40,000 livres annually and the Château de Montargis as a private residence. Henrietta's return to France was delayed by the death from smallpox of her elder sister Mary Princess of Orange. She finally left England in January 1661. She and Philippe signed their marriage contract at the Palais Royal on 30 March 1661; the ceremony took place the next day. The marriage was elaborately celebrated and she and her husband moved into the Palais des Tuileries. As she had married Monsieur, Henrietta was styled Madame, la duchesse d'Orléans. The marriage started well and Philippe seems to have been a doting husband. A year into the marriage, Henrietta gave birth to a daughter later baptised Marie Louise. The paternity of the child was doubted by some of the court, who insinuated Louis XIV or the Count of Guiche was the father. Henrietta and Guiche may have started an affair early in her marriage, despite his having been an alleged former lover of Philippe. These flirtations caused a once-adoring Philippe to become intensely jealous and he complained to Queen Anne. Soon after, Louis started an affair with one of Henrietta's ladies-in-waiting by the name of Louise de La Vallière, who had joined her household at the end of 1661 and had protected Henrietta with regard to the affair of Guiche. 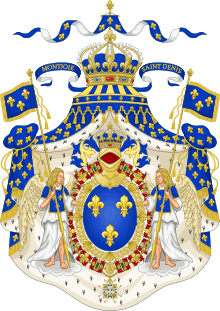 The couple's next child was a son born in July 1664 who was given the title Duke of Valois. The son, however, died in 1666 of convulsions after being baptised Philippe Charles hours before death. 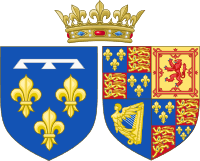 The loss of the little Duke of Valois affected Henrietta greatly. She gave birth to a stillborn daughter in July 1665, but another daughter was born in 1669 who was baptised Anne Marie in 1670. In 1666, her husband's most prominent alleged lover, the Chevalier de Lorraine, became attached to the Orléans household – Lorraine would often vie for power within Philippe's household, an unusual arrangement for the time. Henrietta has often been praised as a cultured princess and her correspondence with Moliere, Racine, La Fontaine, Bussy-Rabutin and others is notable. She was also a lover of gardening, and it was she who created a water garden at the Palais Royal. Henrietta also amassed a large and prestigious picture collection that included paintings by Van Dyke and Corregio. Her active personality has caused historians to think that she showed signs of Anorexia nervosa. Late in 1669, Henrietta lost her mother Queen Henrietta Maria, who died after having taken an excessive quantity of opiates as a painkiller. Henrietta was devastated, and the situation was not helped by Philippe's immediate rush to claim all her possessions before she had even been buried. Henrietta was instrumental in diplomatic negotiations between her native England and adopted France. Her brother Charles II, to whom she had always been very close, had been trying to establish a closer relationship with France since 1663, but it was not until 1669 that he set the wheels in motion by openly admitting that he would become a Roman Catholic and vowing to bring England back under Roman Catholicism. Henrietta was eager to visit her homeland and Louis XIV encouraged her in order for the treaty to take place. Philippe, however, annoyed with Henrietta for flirting with Guiche and his previous lovers, remained adamant that she should not be allowed to go complaining to Charles II that she should remain at his side in France. Appealing to Louis XIV, she managed to arrange to travel to England, where she arrived in Dover on 26 May 1670, remaining there until 1 June, the day the treaty was signed. 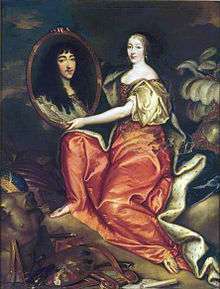 Charles was to abandon England's Triple Alliance with Sweden and the Dutch Republic in favour of assisting Louis XIV in conquering the Dutch Republic, which he claimed for his wife Queen Marie Thérèse as part of her unpaid dowry. Provided that the conquest was successfully completed, England was promised several very profitable ports along one of the major rivers that ran through the Dutch Republic. The treaty did not become public until 1830. After her time in England, she returned to France on 18 June. In 1667 Henrietta began complaining of an intermittent, intense pain in her side. Beginning in April 1670, according to reports, Henrietta began having digestive problems so severe that she could consume only milk. Returning to France after the treaty, Henrietta went to stay at Saint Cloud with her husband on 26 June. On 29 June, at five o'clock, Henrietta drank a glass of iced chicory water. According to reports, immediately after drinking the water she felt a pain in her side and cried out, "Ah! What a pain! What shall I do! I must be poisoned!". She immediately assumed she had been poisoned and asked both for an antidote and for someone to examine the chicory water. She was given common contemporary treatments for colic, as well as anti-poisons. The royal family arrived at Saint Cloud having heard the news within hours. Bishop Bossuet was called and later administered Extreme Unction. At 2 o'clock in the morning of 30 June 1670, Princess Henrietta died. The Chevalier de Lorraine and the Marquis d'Effiat were rumoured by many to be accomplices in poisoning Henrietta. Seventeen French and two English physicians, the British ambassador and roughly 100 other onlookers observed the autopsy, and though the official report stated "death from cholera morbus (gastroenteritis) caused by heated bile," many observers disagreed. Henrietta was interred at the Royal Basilica of Saint Denis on 4 July, another service was held on 21 July. All chief public bodies including the Parliament, courts of Law, Assembly of the Clergy and the City Corporations were represented, as well as members of the nobility and general public. Queen Maria Theresa was present with the emeritus King of Poland, John II Casimir, and the English Ambassador, the Duke of Buckingham. French Princes of the blood were present as well as masses of the nobility. "Last of all came the members of Monsieur and Madame's household, bearing torches in their hands. A mausoleum, surrounded with altars and silver urns, and adorned with a crowd of mourning allegorical statues, among which Youth, Poetry and Music were conspicuous, had been erected in the centre of the choir. There the coffin rested, covered with cloth of gold, edged with ermine, and embroidered with the arms of France and England in gold and silver. Everyone having taken their places hundreds of candles burst into flame giving a cloud of incense; and the Archbishop of Reims assisted by other bishops, began the Mass, which was chanted by the King's musicians organised by Lully." Monsieur married again in 1671 to Elisabeth Charlotte of the Palatinate, who, like Henrietta, was descended from Mary, Queen of Scots, sharing James I of England as a common ancestor. Monsieur and the "new Madame" would have a further two surviving children. Henrietta's eldest daughter Marie Louise died, like her mother, at the age of 26 in Spain in 1689. The circumstances of her death were almost identical to those of her mother's death, and she was also believed to have been poisoned. Anne Marie married in 1684 and was the mother of some eight children, the eldest of whom, Princess Maria Adelaide, was the mother of Louis XV. Monsieur himself would die in 1701. Her descendants include Henri, Count of Paris, the Orléanist pretender to the French throne, the king of Spain, the king of the Belgians, the grand duke of Luxembourg and the pretender to the Italian throne. Philippe Charles d'Orléans, Duke of Valois (16 July 1664 – 8 December 1666) died in infancy. In the 2003 mini-series Charles II: The Power and the Passion, Henrietta is played by Anne-Marie Duff. In the 2009 film Broadside, Henrietta is played by Jessica Clarke. In the 2010 short film Minette, Henrietta is played by Jenna Brighton. In the 2015 television series Versailles, Henrietta is played by Noémie Schmidt. Wikimedia Commons has media related to Henrietta of England.